Politics and its Discontents: See Doug. See Doug Run. See Doug. See Doug Run. Bullies, con artists and cowards all have something in common: they live in fear that they will be exposed for what they are - weak, manipulative people who try to mask their massive inadequacies through bluster, empty rhetoric and false bravado. 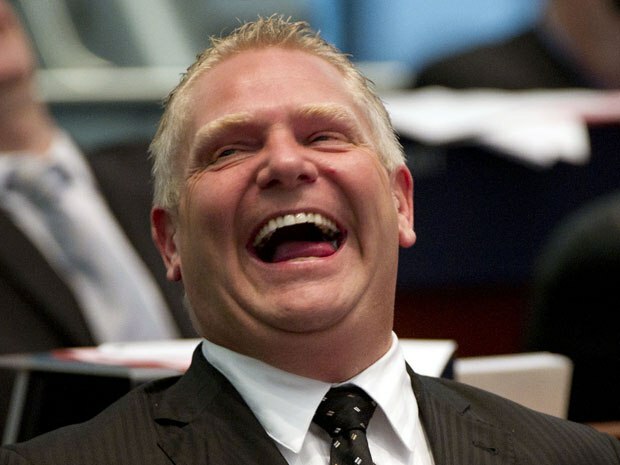 That Doug Ford, leader of the Ontario PCs, seems to epitomize these traits is becoming increasingly evident to those who care to open their eyes rather than respond like the Pavlovian dogs his kind prefer. How else to explain the muzzle that has apparently been placed on so many PC candidates in the run up to June 7? More than 20 PC candidates have skipped debates since the beginning of the provincial election campaign, a trend that recalls similar absenteeism among federal Conservative candidates under Stephen Harper. Candidates from other Ontario parties, meanwhile, have been far more likely to show up. Meredith Cartwright, the Toronto Centre candidate who hired actors to pose as Ford supporters at a leadership debate, was a no-show at an all-candidates’ meeting in Corktown on Tuesday that was attended by the Liberal, NDP and Green party candidates ... She has not spoken publicly since the crowd-for-hire controversy erupted. 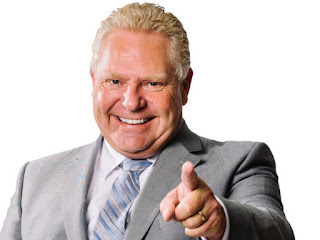 PC candidates skipped four separate debates held this week in Scarborough, including Gary Ellis in Scarborough Southwest, who claimed a long-standing prior commitment; Sarah Mallo in East York; Christine Hogarth in Etobicoke-Lakeshore and Vijay Thanigasalam in Scarborough Rouge-Park, who cancelled the day of the event, according to an organizer. Four out of five PC candidates did not participate in public debates held by the Brampton Board of Trade on May 11, and three of them cancelled on the same day. What does party central have to say about these no-shows? Ford spokesperson Melissa Lantsman declined to confirm or deny. “We work with candidates to ensure they are effective in their voter outreach, be it phone calls, door knocking or debates,” she said. If you would like a fuller sense that the PCs are fearful and in hiding, check out PressPrgress, which details 23 MIA PC candidates. This kind of shielding of candidates from the voters is nothing new, of course. Along with limited access to the leader, it is the same cowardly tactic employed under Stephen Harper, whose contempt for the press was legendary. This is not how our parliamentary democracy is supposed to work, says Duff Conacher, director of Democracy Watch. “Any campaign that tries to control access and control the message is a campaign that is hurting the voters’ right to choose the person they really want to represent them,” he said. Doug Ford wants you. He is, after all, for the people. Of course he is, as long as they are kept ignorant about anything that might challenge his overblown rhetoric and his increasingly tattered credibility. York police are now investigating, Sal, but thus far only one person has taken the fall, Simmer Sandhu, PC candidate in Brampton East. Wouldn't it be a pleasant change to experience a candidate who generated real enthusiasm, someone who you wanted to support? Oh wait, we had one of those in 2015. Didn't turn out well. Thanks, Mound. You've just spoiled my appetite. All we have to fear is fear of those who are afraid to tell us the facts. Despite the "post-truth" era we seem to live in, Owen, facts still matter to many of us. How Self-Aware Are We, Really? Will We Ignore The Evidence Until The End?